Munich, September 10th, 2017 – The 5th World Championship of Beer Sommeliers took place in Munich today. 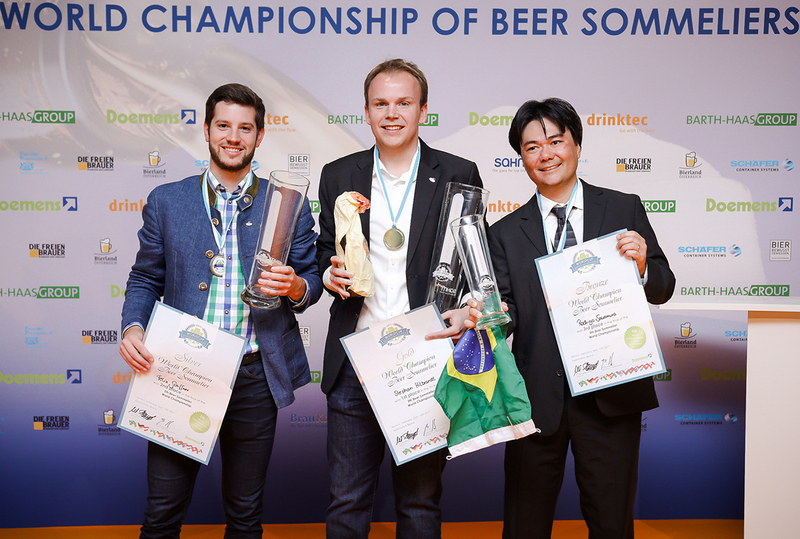 Stephan Hilbrandt from Germany prevailed against a field consisting of 69 participants from 15 countries to become the new World Champion of Beer Sommeliers. Vice Champion is Felix Schiffner from Austria and the third place was taken over by Rodrigo Sawamura. The competition, organized by Doemens Academy, took place today at Messegelände München in the run-up to this year’s drinktec convention. The contenders demonstrated their vast knowledge as well as their considerable sensory skills in the earlier stages of the competition. In the semi-finals, a knockout round which featured the most persuasive competitors from the quarter finals, the remaining contenders were expected to present a beer style to a small audience. During the grand finale, each of the six finalists had to exhibit their full range of skills – including stage presence – before a high-ranking team of eight jurors in front of a live audience. They were given a beer style to work with that they had not previously prepared themselves to present. The Beer Sommelier World Championship takes place in various locations every two years. „There were more contenders from more countries this year than ever before. The standard was higher and the imparted knowledge deeper due to impressive work done at the national level prior to the deciding events at the international gathering. We are very pleased at how this program has developed since its inception in 2009“, said competition director Dr. Michael Zepf, Head of Doemens Savour Academy. Beer sommeliers from four countries competed in the finals, represented by Stephan Hilbrandt and Frank Lucas from Germany, Felix Schiffner and Clemens Kainradl from Austria, Matteo Toso from Italy and Rodrigo Sawamura from Brasil. "The decision was not easy, but Stephan Hilbrandt convinced us completely and was the clear winner. Besides displaying knowledge and sensory abilities, the presentation before an audience was very important to us. If you can be persuasive in this setting, our beer culture will also be well-represented on the outside," says Dr. Wolfgang Stempfl, head juror at the Beer Sommelier World Championship. The World Championship is sponsored by a growing circle of industry players who wish to support the expansion of beer variety and beer culture. Their involvement in past years has made this project possible. The principle sponsors are drinktec, the leading beverage and liquid food trade fair organizers, along with the Barth-Haas Group, the world’s largest provider of hops-related services. Sponsors also include: Bayerischer Brauerbund, BrauKon, Deutscher Brauer-Bund, Die Freien Brauer, Sahm, Schäfer Werke, Schweizer Brauerei-Verband, Verband der Brauereien Österreichs and Weyermann Spezialmanufaktur.